5/13/11: Lake Champlain's record high water levels have affected many Vermonters adversely this spring. 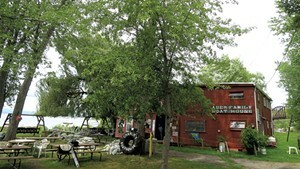 Charlie's Boat House sits at the end of North Avenue where the Winooski River meets Lake Champlain in Burlington. This historic landmark and summer fixture dates back to the 1920s. Charlie Auer was preparing to open for the summer season when the flooding began and now he is not sure what the future holds for the Auer Family Boat House. Eva visited Charlie and his sister Christine last summer in happier (and drier) times (watch the video). This week she returns to the boat house to survey the water damage with Charlie. And as the rain continues, the questions still remain, does this historic landmark have a future? And what would Burlington be like without it?